Parents often worry about what would be the best time to put their child in regular school. To add more to the confusion we have many boards and pre-schools and they all have their own set of curriculum and entry points for children. Truly speaking there are lots of milestones which a child need to cross slowly but steadily before he or she is even able to hold a pencil and scribble down things. These milestones are nothing but the levels which the child needs to reach that helps the parents, teacher as well as doctors to understand the progress and growth of the child physically, mentally and emotionally. Example, by 2 months a child learns to smile, then slowly by 3 or 4 months the neck becomes steady, by 8 months the child can sit and by 12 months the child learns to stand. Now once the child reaches 2 years there are certain things that he or she can do. Show interest to see picture books. Baby begins to say what he needs. Baby tries to repeat words that he or she hears. Baby learns to identify some parts of his or her body. While the social and communication skills of the baby are getting developed, it is the best time to put him or her in play school. He or she would learn through various indoor and outdoor activity and by observing things around. However do not expect the child to start writing letters, numbers or alphabets. In fact, you should not force the child to write. You may start reading words or letters loud and Let the child hear sounds and this way he would learn things by listening and his skills would develop well. This is a good time to check if the auditory sense is getting developed for the child properly. In case you think he or she is lagging behind you may check by reducing background sound or noise and try again if the child is able to hear things properly. If not, it is best advised to check with the doctor as delay in the hearing will further cause a delay in other skill sets like understanding and responding with the external environment. Since this stage is best for oral learning and teaching, it is a good idea to read storybooks, show videos like Karadi path rhymes, then stories and also download some audios and help the child to listen and act on it. In short, the best time/age for pre-school is 2 years to 3 years. The baby is able to respond to oral questions like what is your name? Do you like chocolates? The Baby knows the colors and can name them. The baby is able to put his or her toys and books at right places. The baby is able to throw ball overhand easily without any help. Hence 3 to 4 years is the right age to send your child to nursery or kindergarten. 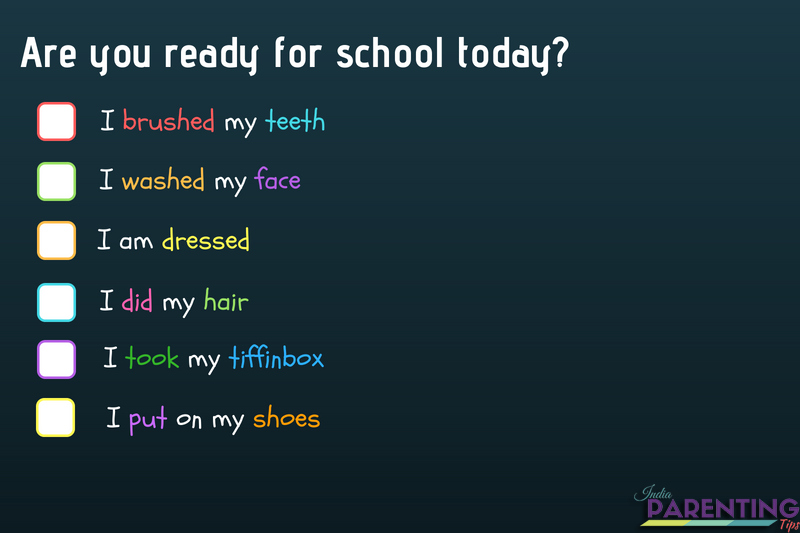 Here is a get ready checklist for parents to check if their child is ready to go to school. 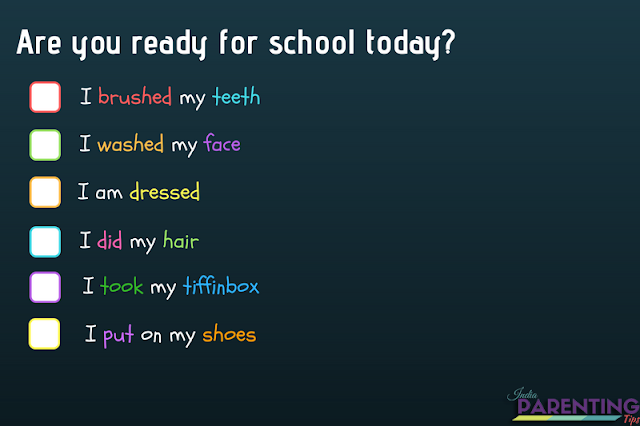 How to prepare the Child for School? Playschool to kindergarten is a great step for every child. The following guide could help you to know and understand what could be your action plan to help your child adjust to the new change for your child. Step 1: Talking things out: Ensure that the child understands that you are not sending him or her away from yourself, it would be a fun place to be in. Step 2: Find out Day 1 Timetable: Find out the timetable for Day 1 activities by discussing with the academic coordinator of the school or teacher and let the child know what to expect in School. Step 3: Get fun stationaries: Get some nice stock of fun stationary for the child to enjoy. It could be him or her Dora pencil or Doremon eraser. Step 4: Ask questions: Try to understand things from the child’s point of view by asking questions the night before about what he or she feels. Step 5: Walk or drive back from School: Make sure that you wait outside the school to receive the child and keep your promises that you perhaps had made to make your child agree to go to school. Talk to your child and give the treat to make him or she feel special and great. Step 6: Communicate with Class Teacher: Ensure regular communication with the class teacher to know about your child’s progress and areas of improvement if any. Step 7: Regular feedback from the child: It is very important to know from the child how his or her day was, what activities were done in school and what he or she do in school every day. This way the child will understand that school is important. Packing school bags for kids and ensure all the essentials are put in a bag on a daily basis can sometimes give a headache for busy moms. 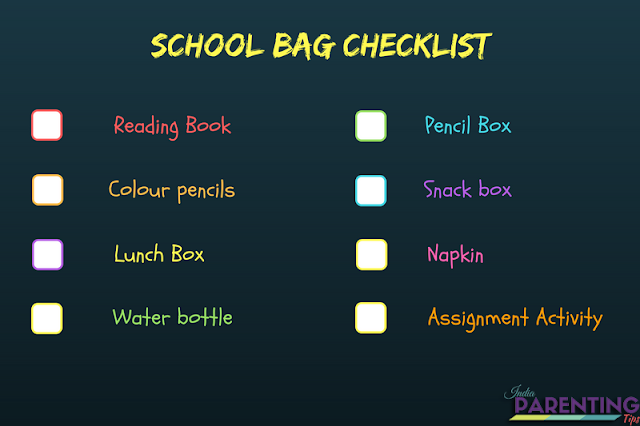 Hence I have prepared a school essential checklist that could possibly help you while packing bags for kindergarten or nursery children. Homework / Assignment activity (if any). Read my article on Homework Stress. Here is a free checklist chart that I have prepared for you to help you to remain more sorted. 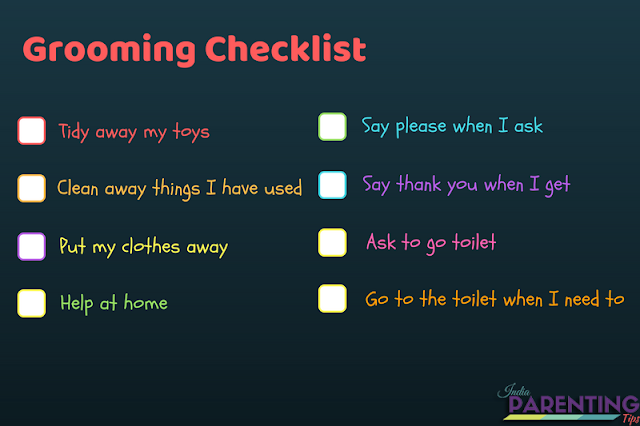 Grooming your child to be independent is another important task for parents to help develop in the child. It is understandable that as parents we shower our unconditional love and affection to our children which is, of course, their right. However, sometimes we overdo things for them out of our love which may not turn up to be helpful and good for the child to be independent, strong and capable. Therefore it is very important that as parents we strike a balance between love and discipline. With discipline also comes tracking school activities and rewarding them from time to time when they achieve their milestones. Here is an example of a basic grooming checklist which might be helpful.